I feel like we’re saying farewell to summer with this one but it definitely worked it’s pie magic. Borrowed from ‘A Year of Pies’, by Ashley English, the only thing I changed was to use my favorite Duchess crust and I cooked the pie a little longer than the original recipe. 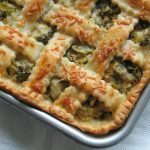 This just might be a perfect pie recipe – enjoy! Roll out your pastry as you would (be quick if you’re using a butter pastry!, I keep a marble slab in my freezer for heavenly pie moments – it’s worth it!) and fit it into the pie plate (deep dish, as usual for me) with a bit extra hanging over the edges. Put this into the fridge for 15 minutes to half an hour while you prep the filling. Put all of the filling ingredients into a large bowl and combine well. Use a sturdy spatula or large spoon to mix, and aim to mash about a quarter of the berries against the side of the bowl to release their juices. Leave the berries to sit for about 15 minutes, stirring the mix a couple more times to make sure there’s no trace of cornstarch or sugar. Roll the second ball of pastry out into a 12+ inch circle and then use a ruler and pastry wheel to cut the circle into 12, 1-inch strips. 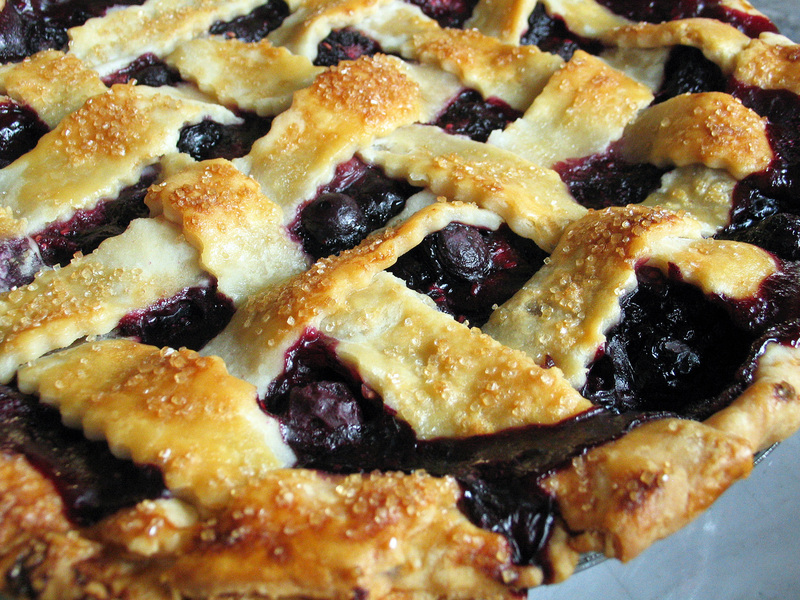 Take the pie out of the fridge, scrape all of the gooey berry filling in, then arrange the pastry strips in a lattice pattern across the top – I used 5 or 6 horizontal and vertical alternating rows. There are oodles of pictures and videos available if you need a visual of this…I just followed the perfect pictures in the book. Finish the top by crimping the edges and making sure that the ends of the lattice strips are pinched together with the bottom crust. Whisk together the egg yolk and water and brush the mix on over all of the visible pastry, then evenly sprinkle on the sugar. Place the pie in the fridge for half an hour, and preheat the oven to 425. Bake on a parchment lined baking sheet for 15 minutes at 425, and then reduce the heat to 375 – this is where I covered the edges with an ‘edge protector’ – and bake for another 30 minutes. At this point I felt the top bits of the lattice were getting a little dark so I placed a sheet of foil over the whole pie and let it bake for 15 more minutes until the bottom crust (I use clear, Pyrex pie dishes) was a lovely golden brown – so this pie will be in the oven for about an hour or more total. Allow this beauty to sit and cool for about 4 hours before you try to slice it.